It’s true, the term Gordita roughly translates as “little fat one” and they are typically served up as hefty masa cakes that are much thicker than conventional tortillas. But I like them best when they are a bit thinner than the conventional sizing, and this Bacon Serrano Gordita recipe is a good example of that style. Instead of cutting them open and adding the fillings after they’ve been cooked, we’re going to add the bacon and serrano directly to the masa dough. Sound crazy?! It’s a good trick to have in your arsenal but keep in mind that you are the master of your Gorditas — if you want them thicker then go for it! I just prefer them when the filling-to-masa ratio is high and adding the fillings directly to the masa dough makes it easy to control this. Gorditas are typically made with lard and this helps keep them moist as they cook — and it definitely makes them taste better! 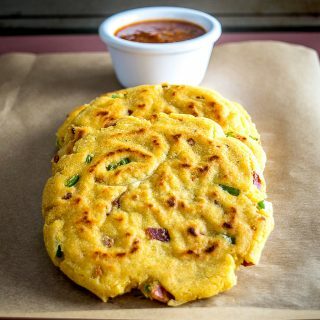 Lately, I’ve been substituting bacon drippings for lard more often (see Flour Tortillas Made With Bacon Fat) and these Gorditas are a great way to add that trick to your repertoire. As usual, I’ll be taking full advantage of the oven in this recipe, but you can always cook the bacon (and tomatillos) any way that you prefer. The tomatillos are for the homemade Salsa. Dipping Gorditas in homemade Salsa is a real treat so don’t skip this step! I had every intention of making a traditional Salsa Verde with this batch, but lately I can’t get enough of the Tomatillo-Chipotle Salsa so I switched at the last moment. 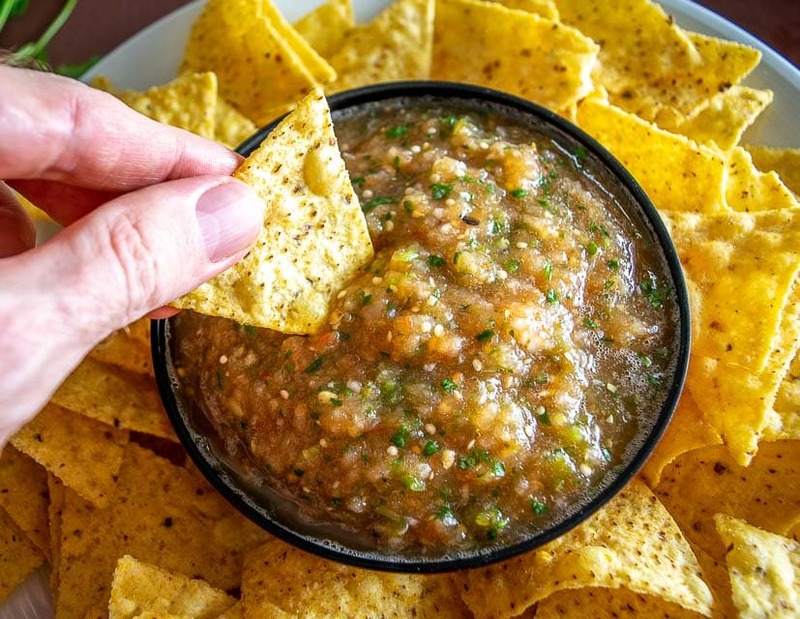 The Tomatillo-Chipotle Salsa is a smoky delight that combines well with the corn flavor, but Salsa Verde would be an equally good option if that sounds more appealing to you. 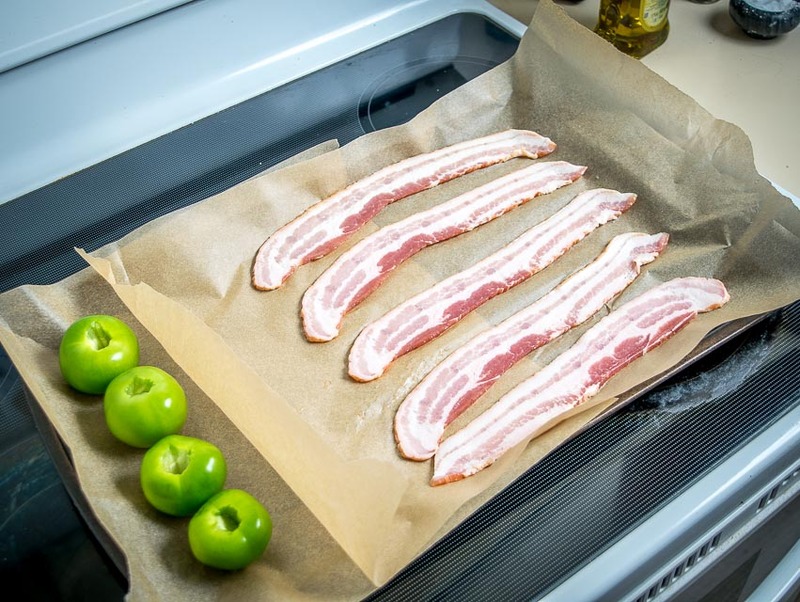 The bacon needs about 20 minutes in a 350F oven to fully cook and while that is usually a bit longer than I roast tomatillos, it’s close enough! 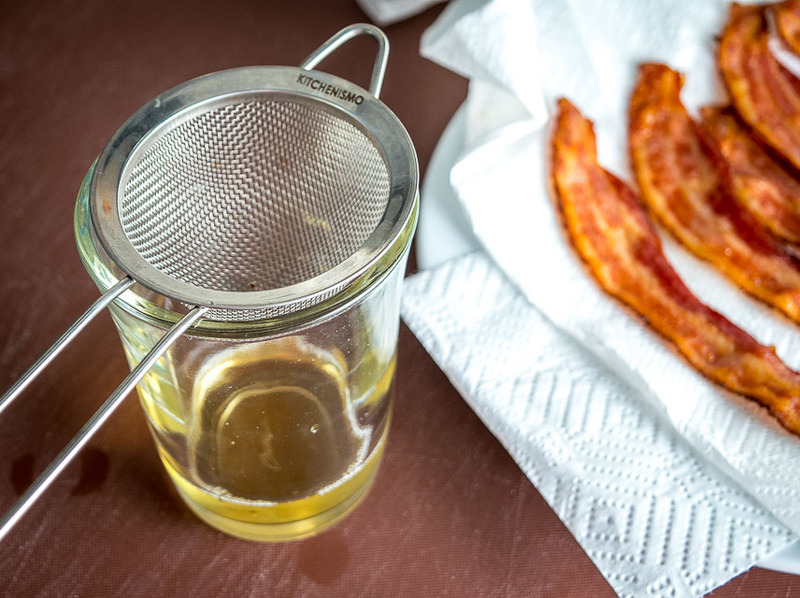 The parchment paper is helpful with clean-up and it also makes it easy to pour the bacon fat into a container. You’ll get about 2-3 tablespoons of fat from 4-5 pieces of bacon. This recipe calls for using 2 tablespoons but you can always back off a little if you want a lighter version. If you have leftovers you can add it to a Mason jar and store it in the fridge. You’re going to need some Masa Harina too! 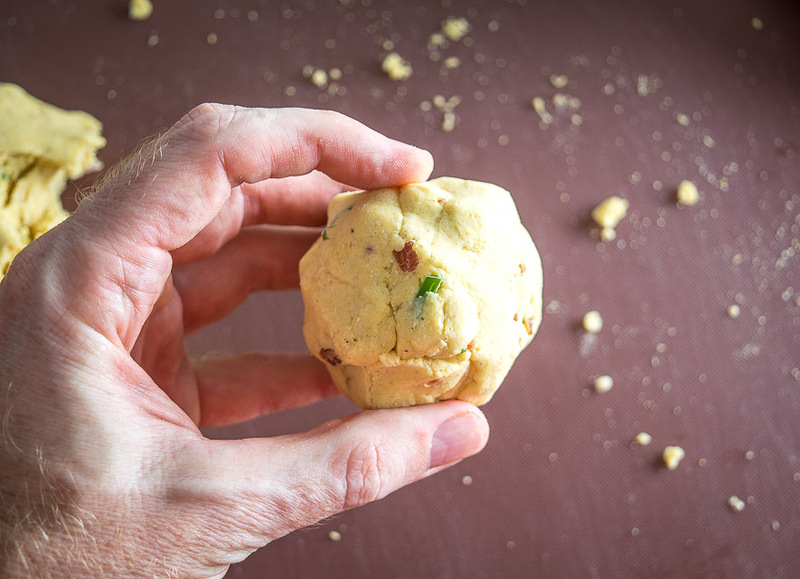 It’s the quickest way to get masa dough in the house. 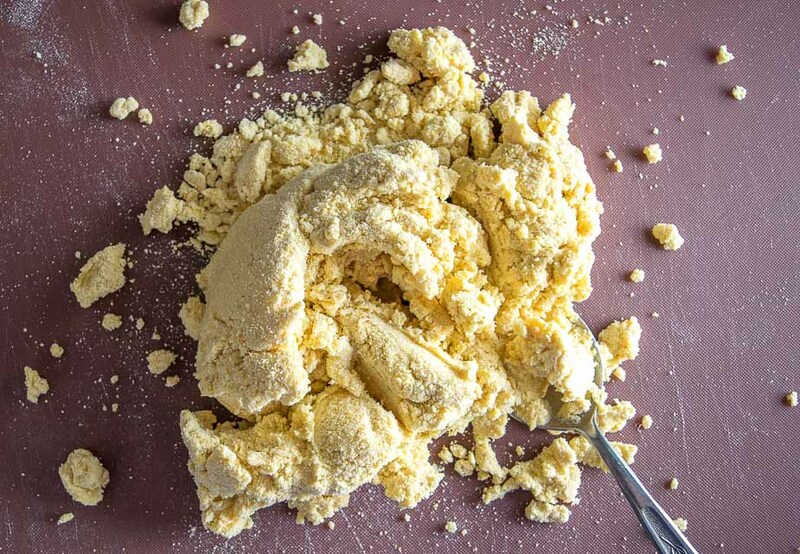 Sure, you could make your own masa dough, or if you’re lucky you can buy freshly made masa from a local Hispanic market, but Masa Harina is the solution for most of us. 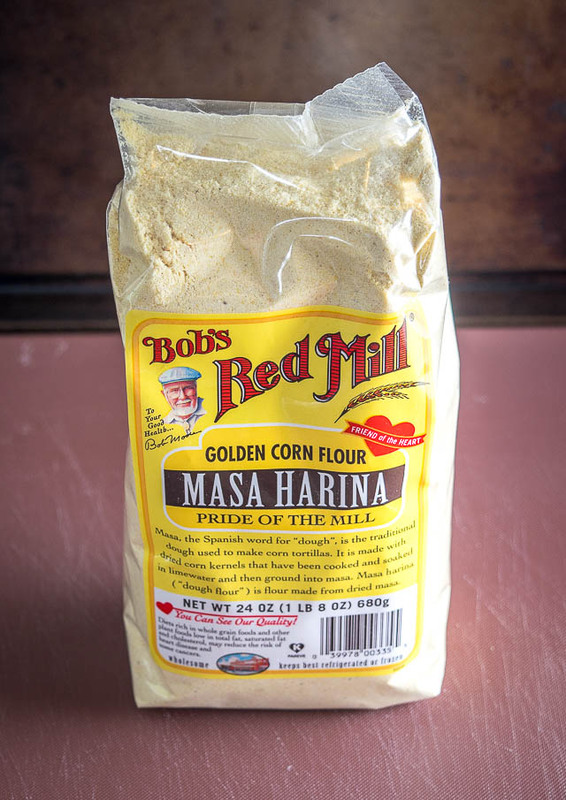 Lately, I’ve been using Bob’s Red Mill, but Maseca is an equally good option (see comparison of Masa Harina brands). Add 2 tablespoons of the bacon drippings along with 1 cup warm water. Combine as much as you can with a spoon and then dump it on a work surface. Next we’ll add the remaining 1/2 cup of water incrementally until a cohesive dough is formed. If the dough is crumbly you need a bit more water. If the dough is sticky then it has too much water and the remedy is a light dusting of Masa Harina. Finely chop the bacon and a single serrano pepper. Add them to the masa dough and combine well. 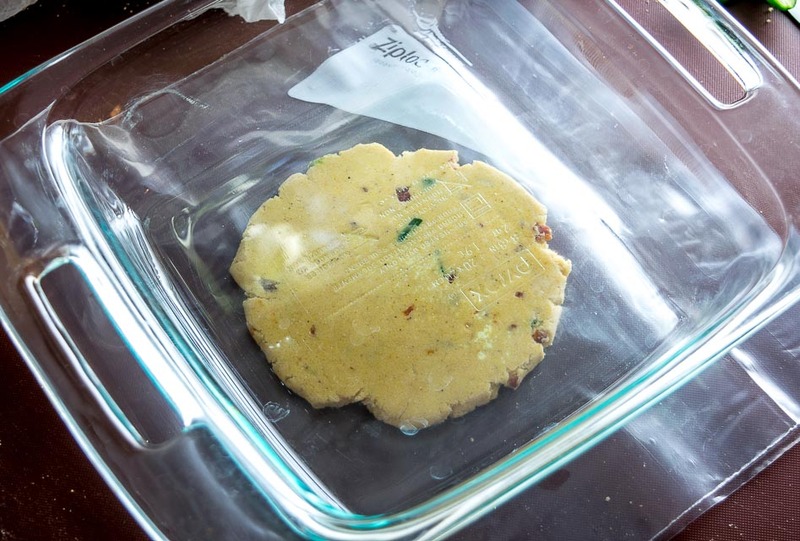 You can substitute a jalapeno and still get a good result, but I used a serrano because they are smaller and that makes it more efficient to add their flavor and heat to the masa dough. 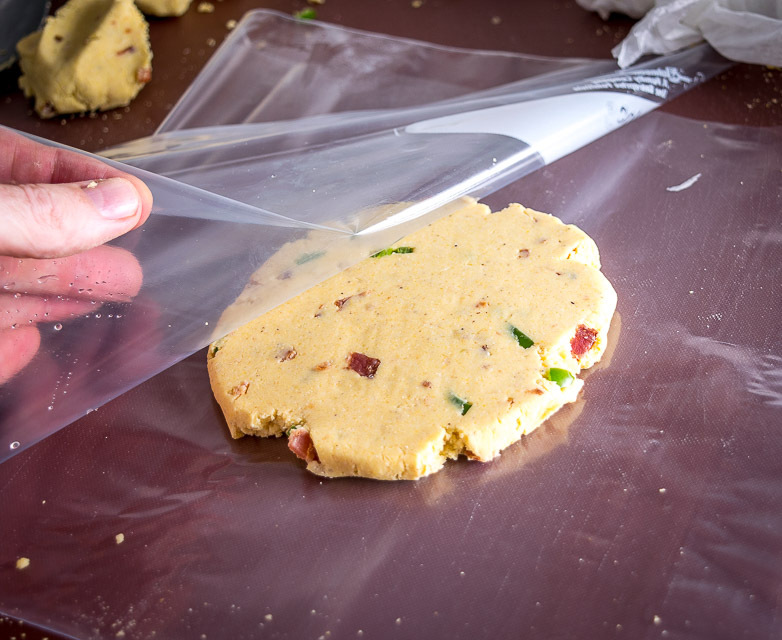 You’ll know if you have the dough consistency right when you peel off the plastic. If it peels off easily with no sticking then you’ve nailed it. Note that you can use plastic wrap to surround the dough balls, but I find it easiest to use a Ziploc bag with the top cut off and the sides cut open. I usually leave the bottom part of the Ziploc connected. Okay, time to cook them! 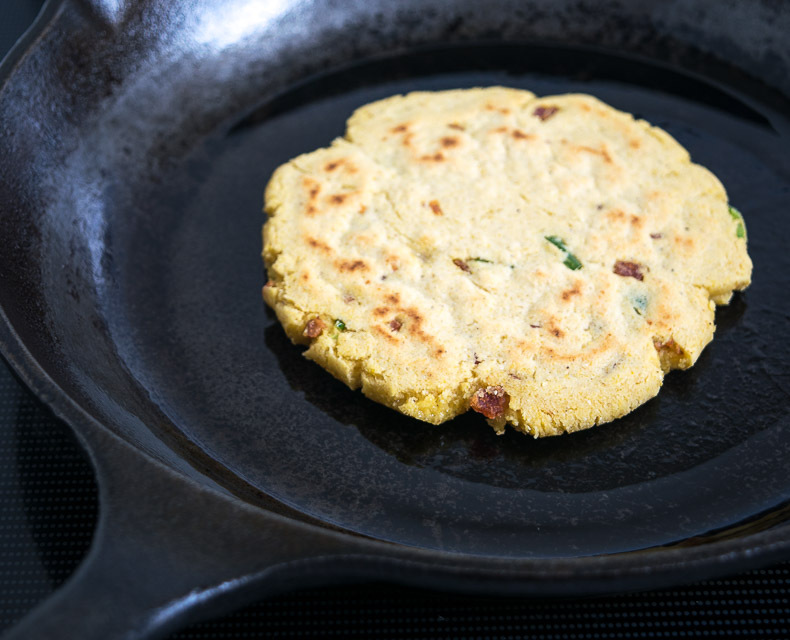 You can see all the various cooking methods in the original Gorditas post, but the jist is that I like them best when they are cooked first in a dry skillet and then shallow-fried to make them semi-crispy. So yes, you’ll need two pans but I think it’s worth it. It depends a little on how thick they are, but typically they’ll need about 2-3 minutes per side in the dry skillet (or until light brown spots are forming). And then about 1-2 minutes in a thin layer of oil to crisp them up. Sometimes I will only cook one side in the oil but it depends a little on how much oil is in the pan. You’ll get 5-6 Gorditas from this recipe but before you eat them you still need to finish the Salsa. Dipping the Gorditas in the Salsa is a real treat so no skimping! And then give it a whirl. If it doesn’t combine readily you can add a splash of water. If all went according to plan you’ve got some scrumptious, hearty Gorditas that are moist, semi-crispy, and packed with real flavor. And of course, dipping them in some homemade Salsa is the killer final touch. 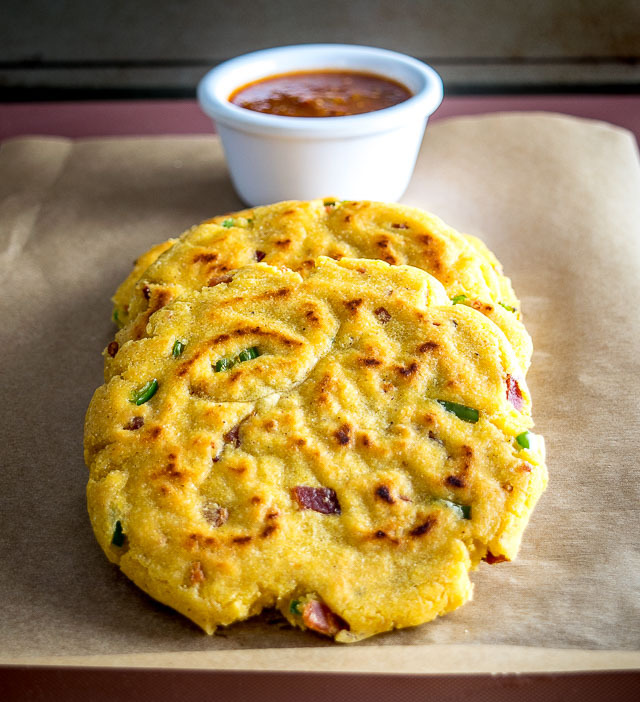 These Bacon Serrano Gorditas are a real treat but don’t forget that you are the Gordita master — if you prefer them thicker then feel free to go full Gordita. Just keep this version in mind if you want a skinny fat one. Would that be called a Gordita Flaca?! 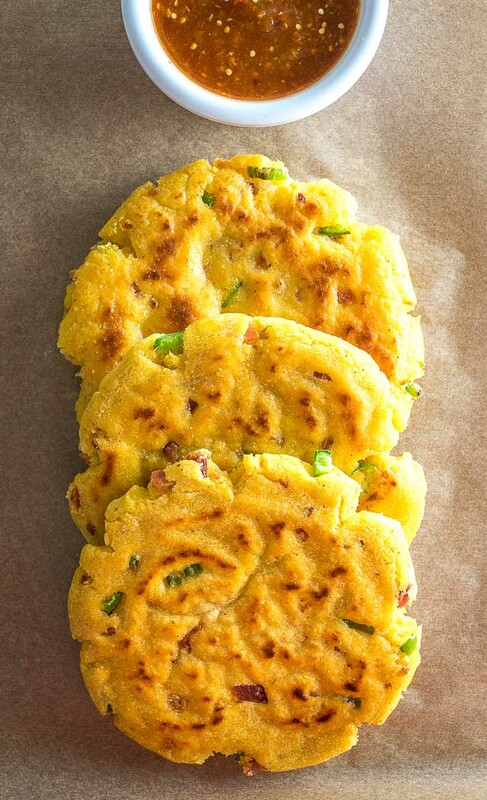 Here's an easy recipe for some Bacon Serrano Gorditas. 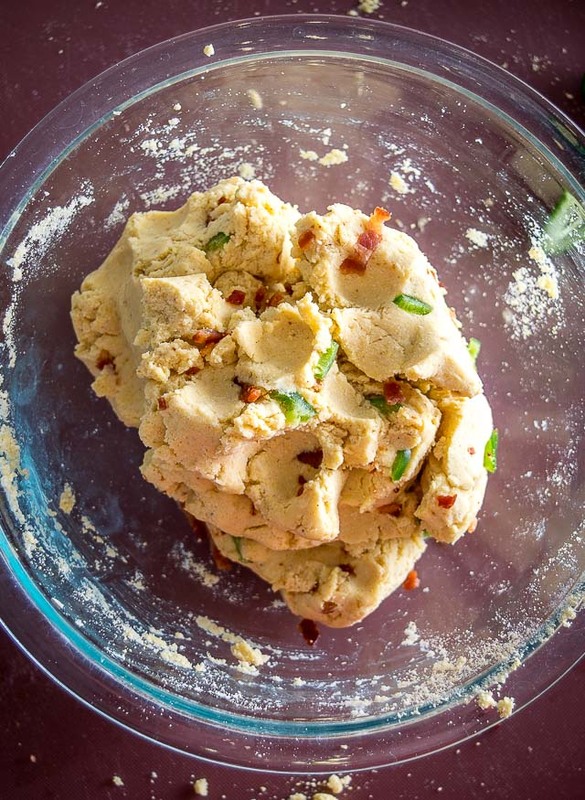 For this batch I mixed the bacon and serrano directly into the masa dough. Yum! Cook the bacon in a 350F oven for 20 minutes or until crispy. 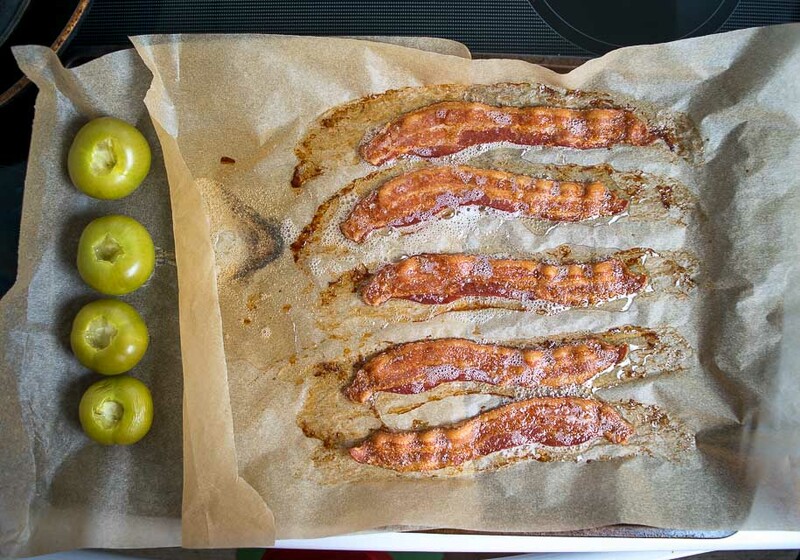 I usually rinse and de-stem the tomatillos and add them to the same roasting pan as the bacon. Lining the pan with parchment paper makes for easy cleanup. Once the bacon is cooked, reserve the bacon drippings. 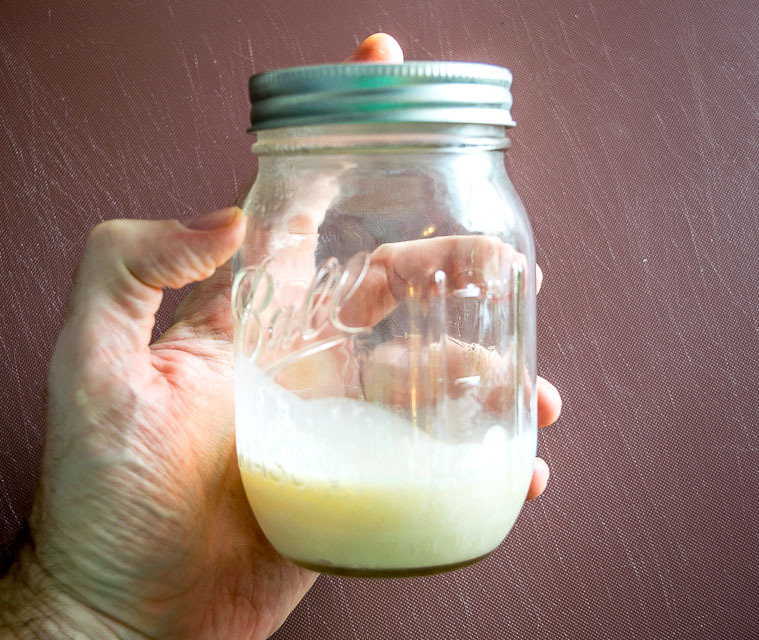 Strain the drippings into a jar or container. Add the roasted tomatillos to a blender or set them aside until you need them. 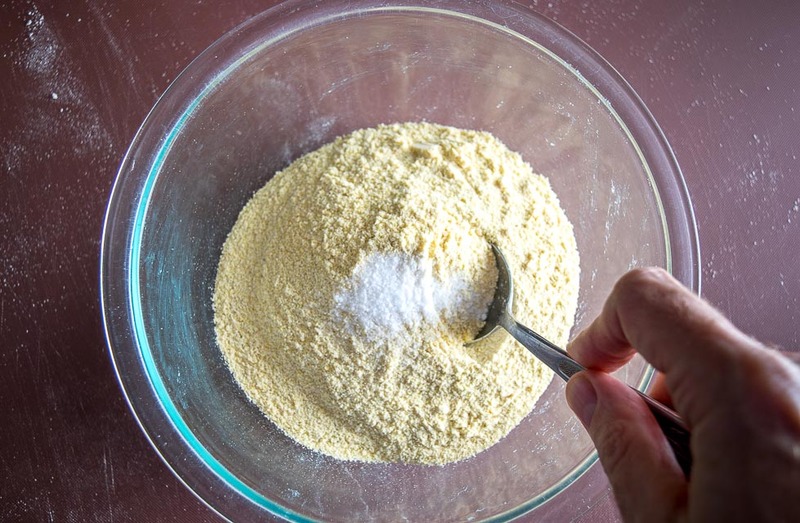 In a mixing bowl, combine 2 cups masa harina, 3/4 teaspoon salt, and 1 teaspoon baking powder. Add 2 tablespoons bacon fat and combine well. Now add only 1 cup of the warm water and combine as much as you can using a spoon or spatula. I usually dump the mixture onto a work surface at this point and add the remaining water (approx. 1/2 cup) a few tablespoons at a time, kneading the dough until it comes together into a cohesive ball. Rinse, de-stem, and finely chop a serrano pepper. Add it to the masa dough along with the finely chopped bacon. Combine well. Surround the dough ball in plastic (I use a Ziploc bag with the top cut off) and use a flat-bottomed baking dish to flatten the dough ball to 1/4" thickness. Keep in mind that you can always make them thicker at the cost of a longer cooking time. Pre-heat a dry skillet or comal to medium heat. 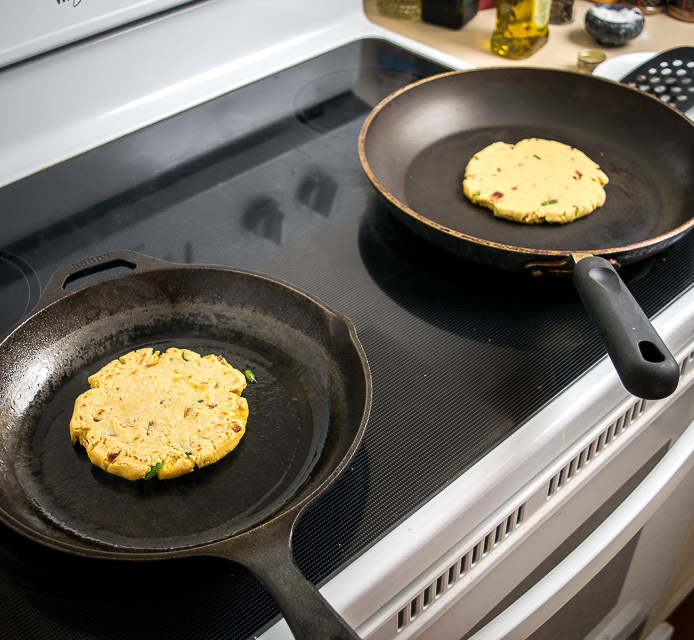 Cook each side of the Gordita until light brown spots are forming, approximately 2-3 minutes per side. Add the partially cooked Gordita from the dry skillet and cook it in the hot oil for 1-2 minutes or until the bottom side is brown and crispy. You can optionally cook the second side in the oil but I frequently will only cook the first side. Set aside to drain on some paper towels and continue cooking the rest of the Gorditas. 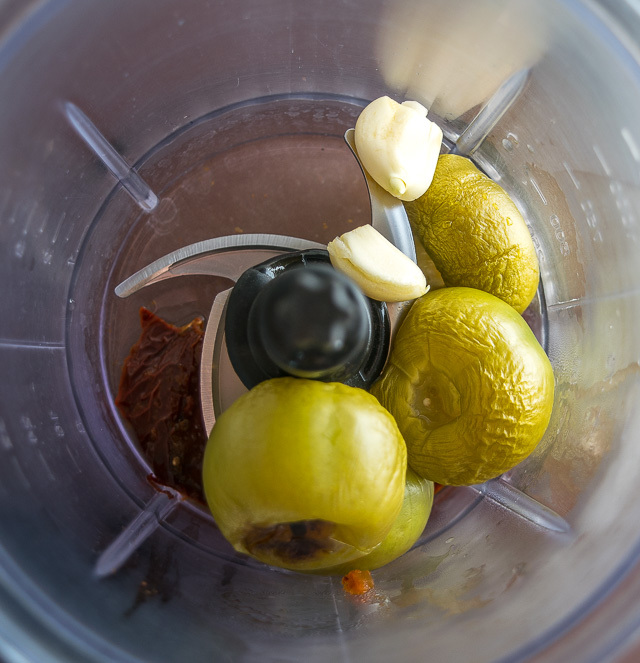 To finish the Salsa, add the roasted tomatillos to a blender along with 2 peeled garlic cloves and 2 chipotles in adobo. I usually de-stem and de-seed the chipotles. Combine well. If it doesn't combine readily you can add a splash of water to it. Serve the Gorditas alongside the homemade Salsa. Cooked Gorditas do not store well, but sometimes I will store leftover Gordita dough in the fridge where it will keep for a few days. Getting the consistency of the masa dough can be tricky the first time you make it, that's why I usually recommend adding the final 1/2 cup of water incrementally. If the dough is crumbly you need a bit more water. If the dough is sticking to your hands it means it has too much water and the remedy is a light dusting of Masa Harina. 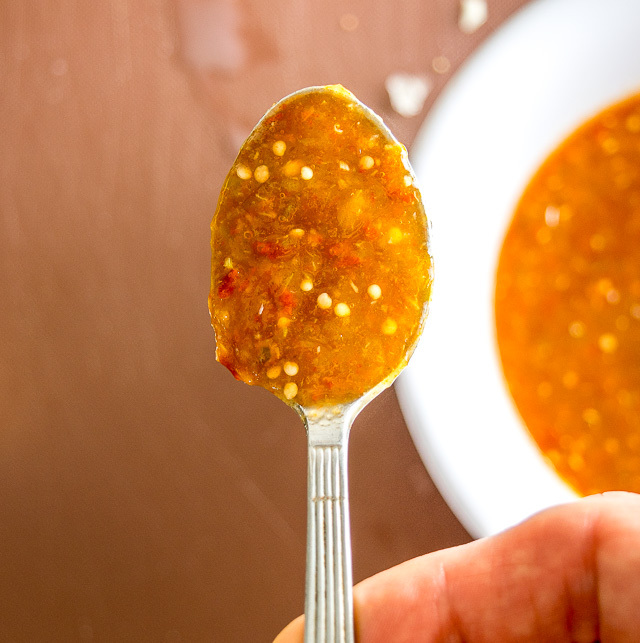 Our latest post is this delicious Roasted Tomato and Tomatillo Salsa. This sounds so good! I wonder, what else could I substitute for the bacon? I think I’m only one of a few people in this world who doesn’t care for bacon! I love the idea of the peppers, but what else could I throw in there? I was thinking shredded chicken? Maybe not? I want to make this for certain! Love your recipes and website! Hi Susan, thanks much for your feedback! Let’s see…I think small, concentrated thingys that aren’t too wet will work best so that the masa dough can fully cook. I would be tempted to try a version with whole, cooked black beans and some bits of Cotija cheese. Small bits of cooked Chorizo might work too. Smallish bits of roasted poblano might be an option too. I think the flavor of chicken might get overwhelmed by the corn flavor. Okay, hope this helps a bit. Let me know how it goes! Made these gorditas tonight along with the salsa to go with my husband’s nachos. His nachos are not authentic but they are good—crispy tortillas with refried beans and cheese and pickled jalapeños. The salsa was great and will use the leftovers tomorrow when I cook Mexican stuffed keto peppers for my daughter’s family. I did have gorditas left over because the two of us were stuffed but I am saving them anyway and will try to resurrect them—they were really good! Awesome thanks much for the feedback Debbie! Yeah another shallow fry might wake them up tomorrow, definitely worth a try! Cheers. It’s 6:31 A.M. here in Portland, I’m awake, I’m hungry, I just read this recipe. I don’t have any of the ingredients and the nearest store won’t open for another 30 minutes or so. Could I settle for cereal or perhaps P butter toast? No. As with every recipe you’ve provided and I’ve made this will be, no doubt, delicious. It’s rainy and now I want to go out in it. Thanks JG! Yeah these Gorditas would be perfect for a rainy morning, I hope they treat you well!